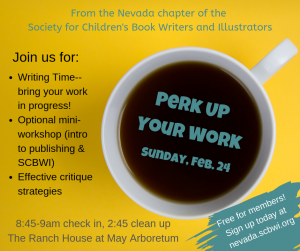 Join us on Sunday, February 24th at the Ranch House at May Arboretum for a day to work, get information, and perk up those critique skills with friends! The day is free to SCBWI and May Arboretum Society members. We’ll provide beverages and snacks and would appreciate members bringing items to share during lunch at this pot-luck-style event! Walk away with progress on your project and some potential critique connections! Register today so we can save a space for you! It’s going to be a terrific day! Questions? Write to Julie at nevada-ara@scbwi.org .